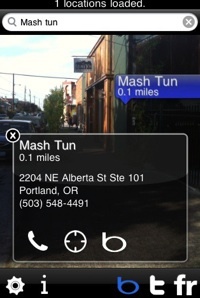 Bing is beginning to find its way onto the iPhone through apps that build on top of its APIs. One that just hit the iTunes Store is an augmented reality app called Robotvision (iTunes link). Like other AR apps, it uses the video camera on the iPhone 3GS, as well as the GPS and the compass to bring up data about nearby restaurants and shops, including reviews. It gets this local business data from Microsoft’s Bing search engine. Once you find a place nearby, you can call it the business from within the app. A lot of this functionality is already in the current Yelp iPhone app hidden as an Easter Egg, but Robotvision has some nice extra features. For instance, a feature is triggered by looking down at the screen, which shows the business and others like it as pins on a map. You can toggle back and forth between augmented reality view and map view depending on how the phone is positioned. (see video demo below). Robotvision also shows you nearby Tweets and geo-tagged Flickr photos. I’m not sure how useful these are in an augmented-reality app. Basically, these are best suited for surfacing information about a place directly in your view or right around the corner. There are plenty of Twitter apps, like Twinkle, that show you nearby Tweets. For the most part these are pretty useless unless they are people you know. I guess it would be cool to be able to point your phone’s camera to a crowd and see related Tweets from people in that crowd, but Robotvision isn’t quite that advanced yet. Last month, Microsoft announced its Bing iPhone SDK, which this app is using.